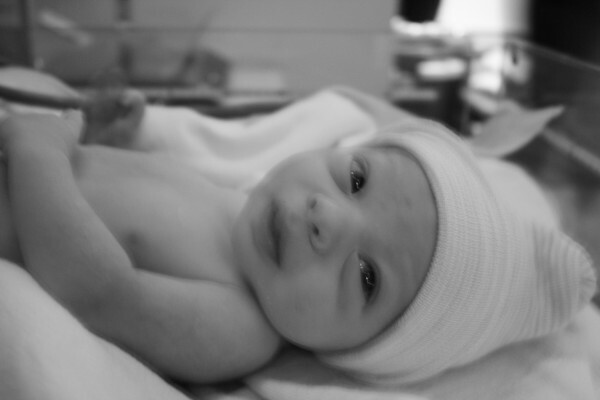 Part I of Elliott’s birth story can be read here. My midwife said that an epidural would be the best way to relax my cervix and make the progress I needed to birth my baby. At this point, I had been laboring without drugs for 14 1/2 hours, including pushing for 2 hours. I was dead tired. My legs shook uncontrollably, even when I wasn’t experiencing a contraction. My midwife also mentioned that a C-section was potentially needed since the baby would go no further into the birth canal. I looked at Brad and then realized what I needed to do. If it would help get my baby here, I would get the epidural. Brad was a wonderful coach. He asked me if I was sure. Up until that point I hadn’t even let the thought of drugs enter my mind. I was determined and as Brad can attest, I am one hell of a stubborn person. I felt like I had given it everything I had, but it just wasn’t enough. I was told that I couldn’t push anymore and I had stopped making any progress despite my painful contractions. My body had reached a breaking point where it refused to go further without medical intervention. I felt like I had truly done everything I could. The funny thing is that once I decided to have the epidural, the anesthesiologist could not get there fast enough. I had to stop pushing but continued to deal with very painful (although ineffective) contractions. Finally the doctor got there and took pity on me and agreed to giving me the epidural while lying down. He usually gives them with the patient sitting upright, but even that felt like something that I couldn’t do at the moment. 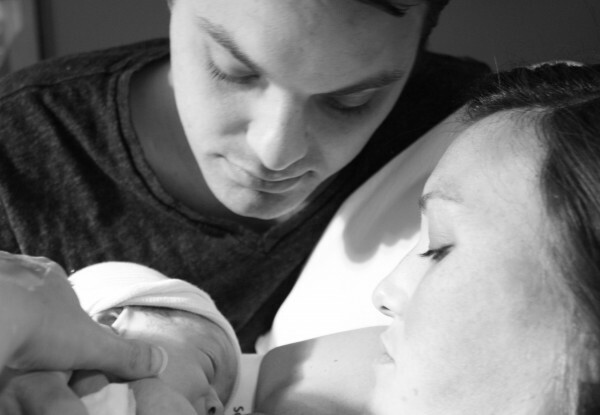 Within minutes of the epidural, I was amazed at the sense of numbness that washed over my body. My contractions went to on the verge of being unbearable to a slight pressure I could almost ignore. However, the epidural also slowed my contractions, which is a common effect. My contractions, although painful, were never very easy to predict and were all over the place. The midwife told me that now my contractions were almost nonexistent. She immediately brought up the C-section again and then brought in the OB/GYN on call that would perform the surgery. However, he had other ideas and told me he wanted to try to avoid a C-section if possible. (Can you image the doctor taking the less invasive approach over the midwife?) He suggested using Pitocin to get my contractions going again. In the course of an hour, I went from trying to have a natural childbirth to trying anything to not have a C-section. So we agreed to the Pitocin and in the course of an hour, my cervix was completely dilated and my baby actually made progress moving south into the birth canal. We tried pushing for a while again, which was a breeze after doing it without drugs, but made no progress and Elliott’s heart rate dropped again. The doctor noted that I made the most progress, just sitting back and letting the Pitocin work, so he wanted me to relax for another hour, try to sleep, and we would just wait and see what happened. So we waited. And by the time the hour was up, the baby had made even more progress. I was very encouraged by this and while I could have been hugely disappointed at the course my birth was now taking, I was really just relieved that we were making progress and my baby would be with me soon. The doctor said he wanted me to push again, and that he wanted to use the vacuum to get Elliott out in a hurry. I never thought I would have agreed to it, but I was still afraid of an impending C-section if we couldn’t get my baby out soon. So I said okay to the vacuum and started to push. For the first time ever, I could feel the progress being made. I could tell the baby was moving lower in the birth canal, because I could feel an extreme amount of pressure in my pelvis. It didn’t really hurt, but it was very uncomfortable. I pushed through one contraction, then rested through the next. The doctor said he would have to give me an episiotomy or I was going to tear. At this point, I couldn’t really think, the pressure was so distracting. 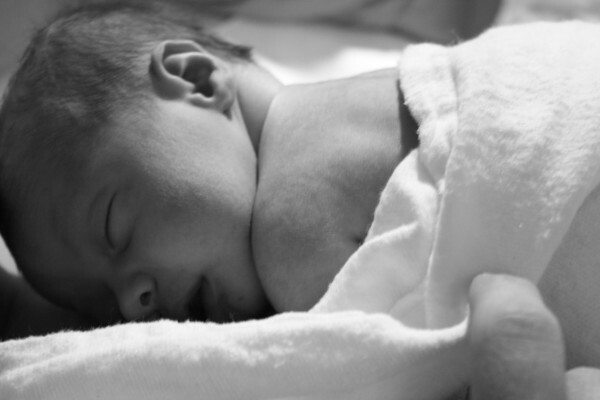 So I got the episiotomy, even though at the time, I wasn’t even aware that it happened. And then I heard the doctor say, “His head is out. Feel it.” So I reached down and felt the furry little head of my baby. I was so overcome with emotion at that moment and so incredibly ready to see my baby. My birthing team then encouraged me to push with everything I had so I did. And with two more pushes, I heard everyone saying “You did it! He’s out!”. Just before me was my baby and his long gray umbilical cord. 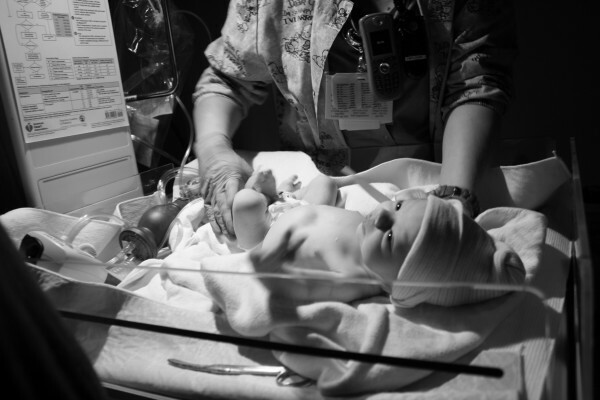 The midwife went to cut the cord, and Brad stepped in and said we wanted to wait until the blood stopped pulsing. However, she said he would have to be looked at by their pediatric team immediately, so Brad took the scissors and cut the cord. It was then that I realized how many people were in my room. There was the doctor, the midwife, my nurse (who was wonderful), a woman who was introduced as a doctor from the OR earlier, and a few people who made up the pediatric team (plus Brad and Rachel). They immediately whisked Elliott away to the corner of the room to examine him. I asked how long until I get to see my baby and they said just a minute, which turned into 10 minutes. In the mean time, the doctor told us that our baby was very mellow and we heard a few wonderful squeaks from Elliott. Brad snapped a few photos as I asked several times when I could see my baby. After 20+ hours of labor, I had absolutely no patience. Finally they brought him to me. He was absolutely beautiful. I had a few ideas of what my baby might look like, but my ideas were nothing like the perfect baby boy that was handed to me. His eyes were huge and he had a perfect little button nose and the most beautiful full lips I had ever seen. I was told while I was trying to push, that he had hair, and he had not too much and not too little. He appeared to have had his hair cut in a perfectly straight line at the nape of his neck. One of the first things I did is check out his thumbs to see if he had my “toe thumbs”, which he did not. I guess I’m the last of a dying breed. He had the longest fingers and very long feet. The pediatric team reported that he weighed seven pounds and eight ounces and measured 20.5 inches long. Brad and I cuddled and marveled over the beautiful baby that we had made together. We softly talked to him and told him his name and how much we loved him. At that moment, it didn’t matter how he had come into this world. It didn’t matter that things didn’t go as I had hoped and planned. He was here. He was healthy. And he was the most beautiful thing I had ever seen. 1) I totally checked Wyatt for toe thumbs too and he didn’t get them either! 2) I had such a similar experience. Natural birth plans but an epidural ws medically necessary or I’d need a c-section. Just like you, I was perfectly OK with it. It really doesn’t matter how they get here, just that they do <3 I can't wait to meet your sweet angel! He really is adorable. I’m sorry you didn’t get the birth you wanted, but you’re right – it really doesn’t MATTER how he got here, it’s matter that he’s HERE. As I’m sure you’ve discovered, babies have a way of changing everything and doing thing there way… and that doesn’t end any time soon. Hope you are enjoying those newborn snuggles!! Kelly, you are a great story teller, and (of course) the story you have to tell is so beautiful! I can’t even imagine what giving birth is like, but I know you deserve an ENORMOUS congratulations! Loved reading your story, Kelly. He is perfect! Loved your story, Kelly (and the pics are beautiful!) None of my births went the “perfect” way I had imagined (natural, smooth, baby immediately on the chest, etc). But now when I think back to the day each of them were born, I don’t think about *how* they got here, rather, the first memory that enters my mind is that first moment I met them. 🙂 Congratulations, such a beautiful baby! I cried 🙂 Hi, Elliot. Nice to meet you!!!! Absolutely loved reading your birth story! I’m due in exactly one month and am getting extremely anxious over it, although I plan on getting the epidural. I commend you for waiting so long & giving it everything you got. Was it just you & Brad in the delivery room besides the doctors & medical staff? Just curious who took all those photos for you. My doula took them. Good luck! I hope your birth goes great and your baby is healthy!